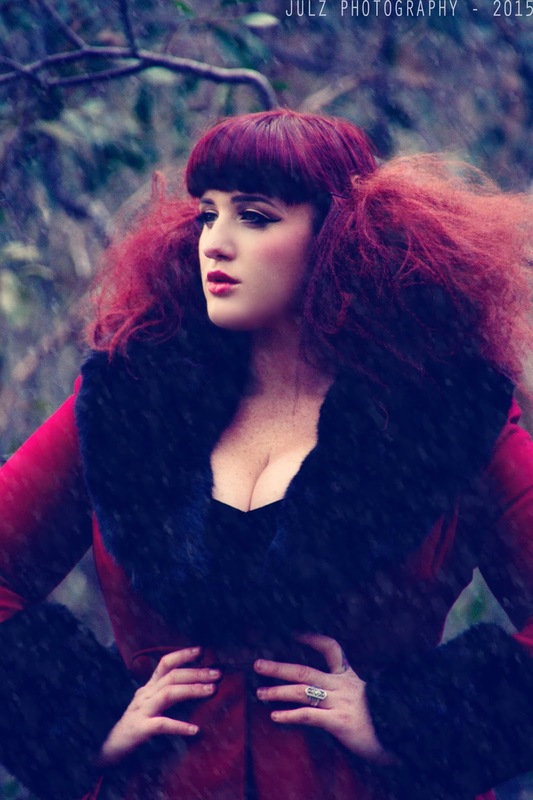 This winter I've fallen in love with a stunning winter warmer named Shonna from Hell Bunny's winter coat collection, a calf length and very formal looking style winter coat featuring black faux fur cuffs and a matching collar. Unless you've been hiding from my blog or even my Instagram, you should know that I have a coat addiction. I own around 15 winter styled coats, 7 of which are bicker jackets and 4 which are leather biker jackets. From plaid to gingham and core colours such as teal, navy and black, I own a selection of motos, trench coats, water fall jackets and even a tuxedo jacket. Until now I've I've never owned a longer style non trench coat and this is definitely going to change from this point onward. The Shonna coat is magnificent! A super thick long length number that not only keeps warm on the coldest of days but instantly makes any outfit more regal and elegant. This coat has enough room around the waist and in the sleeves to fit the many layers you might need this winter but still keeping that hour glass shape. As with all my other Hell Bunny coats I'm wearing this style in a XL and it's an amazingly comfortable yet faltering fit. The deep V neckline gives me a little extra room in the bust and I love that I can show a whole lot of cleavage whole still keeping warm. Whenever I wear this coat out people either stop me on the street to tell me how much they adore it or I just get a whole lot of stares (in the best way possible). It gives off both a old Hollywood depending on how I choose to style it. Then paired with my favorite winter items and on a dark and gloomy Melbourne day it almost has a Brothers Grim fairy tale style about it. I've fallen hard for this coat and need to get my hands on both the black and the teal version as soon as humanly possible. They are so easy to wear and style, every woman needs a Shonna in her collection. I paired this coat with a more spring time style to show just how easy this can be to wear with pale and soft colours. The Annalise dress is a stunning pale floral swing style dress with flowing layers, a fitted waist and a cross over bustline. A new style from Hell Bunny with more delicate and intricate design features. I'm wearing and XL in this as I tend to wear in all Hell Bunny items but due to the complete lack of stretch in the fabric my bust did not fit into the very structured bodice/cupped area. This style is a great fit everywhere else but if I wanted a perfect fit in the bust area I would have purchase one size up. So if you are over a D I would recommend you size up! Asides from that one fit issue it is an amazing fabric and I would love to see this in a swing style skirt with a belt. The flowing layer would look amazing in a full skirt and with additional colour ways such as black and navy the styling options would be endless all year round. From the moment I ordered this Shonna coat I need exactly what shoes I wanted to pair with it. For the last 12 months I've been searching high and low for a pair of lace up, knee high black boots with a little edge and a medium sized heel. It's been harder than I expected to find such a product but luckily Shoe Me Gorgeous came to the rescue. Featured in the latest Bettie Page Shoes catalog were these lace up faux leather an faint skull printed boots were EXACTLY what I've been searching for. 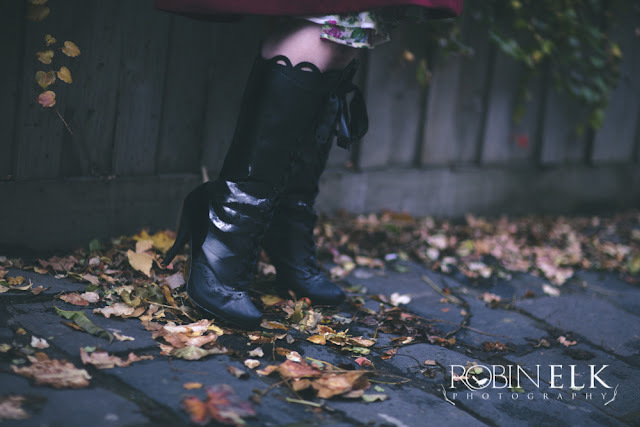 With scalloped edging, a mixture of faux leather gris grimly skull printed fabric and velvet detailing these boots are amazing. With a gothic fairy tale edge these are unique but also pair wonderfully with everything in my wardrobe. From dresses to full style swing skirts, over jeans of paired with stockings and pencil skirts - The possibilities are endless. I have recently found out that Bettie Page shoes unlike brands such as Bordello are closer to the Australian size range that others. So if you are ordering this brand be sure to stick to your AU size. I found the top of this boot rather roomy and they will easily fit over jeans and super thick stockings. Now these are not listed on the Shoe Me Gorgeous yet but if you are interested in purchasing them please contact them via the website or on facebook and they will be able to order you a pair asap. As you can see I love this coat that much I used it in two different photoshoots! Many thanks to Julz Photography for the first image with the amazing hair and makeup of Cherry Bombshell Beauty. I would also like to thank my awesome photographer Michael from Robin Elk Photography who snapped these images straight after our LuWow shoot! What change in look! I love how it works perfectly with both a pinup hair style and a more creative and high fashion hair look. I've found this to be a deeper darker red apposed to the bright candy colour of the link provided.